Here’s something that I suspect a few people out there will be surprised I didn’t know – but as far as I’m concerned, if I didn’t know it then it’s worth blogging about. We could build a dimension off this with attributes for Country, State, City and Customer, and for two out of our three customers that would be fine. However the Pope lives in the Vatican, which is (at least for the purposes of this exercise) a Country with no concept of City or State; and in the case of customers who live in the Vatican, we just want to be able to drill down on the Country ‘Vatican’ and see all of the Customers who live there without drilling down through a meaningless State and a City. …in the connection string. And of course Excel 2007 hard-codes MDX Compatibility=1 in the connection string and doesn’t allow you to change it, so you can’t use ragged hierarchies properly. However, what I didn’t realise until last week when I was moaning about this to TK Anand from the SSAS dev team at PASS, is that for some ragged hierarchies you don’t need to set the MDX Compatibility connection string property at all. The difference here is that we’re hiding all members below the State level right down to the bottom of the hierarchy, rather than hiding members somewhere in the middle of the hierarchy. 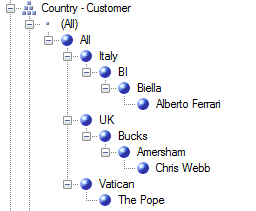 Truly, this is one of those “Doh, if only I’d known!” moments… this at least means that in some of the scenarios where you’d use ragged hierarchies you can get them to work with Excel, even if it means that we have to hack the data (‘The Pope’ is a Customer, not a State or a City). 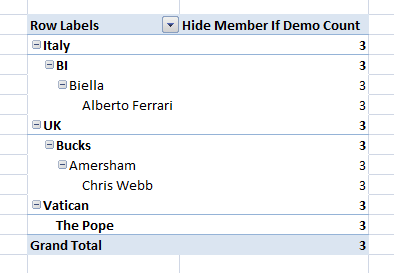 On the other hand there are plenty of scenarios where you do need to hide members in the middle of a hierarchy, and frankly I don’t see why Excel 2007 can’t set MDX Compatibility=2 in its connection string so they work properly. Good article, happy to read it: I was discussing this fact last week with one of my colleagues, an d I thought I was becoming crazy or something. I think we have no alternative except always putting the "repeating" data on the bottom of the hierarchy. I\’ve tested on several SSAS versions and the problem seems to be quite old. Nevertheless thanks for this! It’s really a stupid thing..
Just a note… your solution work if you have oneToMany relation inside dimension, right? What do you mean by a ‘one to many’ relationship? Do you mean attribute relationships? In any case, the solution should work for all dimensions. Vatican->Vatican->Vatican->The Pope. Any advice please! What do you see in Excel? I’ve just tried this on my R2 instance, and it’s working fine. Can you check your data and that you’ve set everything up correctly? Ah, hold on, I’ve just read your comments properly – yes, the whole problem is that if you do Vatican-Vatican-Vatican-The Pope, then you can’t get this to work in Excel or in the browser. This approach will only work if you can set the MDX Compatilibility property, which isn’t possible in Excel. You’ll have to remodel your data if you do want it to work. Do you mean BIDS browser is not ‘sensible’? I can accept Excel not be able to display this property, but BIDS browser…??? How can it be possible BIDS browser can’t display its own properties? I know, I know. But it’s true – the BIDS browser doesn’t do this. I’m looking at using this approach but SSAS R2 Books Online say that HideMemberIf is being deprecated in the next version. As this is the only real way to get pre-aggregated data into a cube without using P/C do you have any idea what it is going to be replaced with? It’s not true that HideMemberIf is being deprecated – I’ve seen that before and asked the dev team, and BOL is wrong. So feel free to use it. I am trying to do something similar with an organisation structure dimension. I have eventually written a stored proc. to manually remove the spaces/repeats at each level. Now I have my ragged hierarchy how do I get it to display correctly in SSRS? I can see it perfectly in Excel pivot table but SSRS is a different matter. Only branches that extend to the last level are displayed. Even a Parent/child hierarchy does not display properly in SSRS. If the answer is too long perhaps you know of a good resource? Thanks for a good article! Matt. … but I’ll have a think about it and get back to you. I could probably comment on every single post you make, Chris, but this one was particularly helpful today! Thanks for helping me navigate the wild, wacky world of Microsoft BI. As per the notes I can get things working if I repeat the ‘Leaf Level’ up the parent levels and set [HideMemeberIf] to ‘OnlyChildWithParentName’. However, if in my case I need to hide the level below 2. Setting the [HideMemeberIf] to ‘NoName’ does not appear to work. Any ideas? Can you also please explain where I can set MDX Compatibility in SSAS dimension browser and in the PerformancePoint data source. The point is you can’t use a null value – you need to copy the value from Level 3 up if you want to avoid using the MDX Compatibility property (you should also avoid using null values because it will stop you building effective attribute relationships). You can’t set MDX compatibility in the dimension browser; I’ve not tried, but you should be able to add it to the connection string in the connection object in PerformancePoint. [HideMemeberIf]=’NoName’ for all levels. Empty refers to empty strings, i.e. ”, . I guess what has been confusing me is that you cannot see the true results in the dimension or cube browser. What’s the easiest of visually checking if the ragged hierarchies are working as expected? You can manually alter the connection string that Excel uses. Thanks for your help. I will give a whirl in Excel. It’s a real shame that the cube browser or dimension browser do not show ragged hierarchies appropriately. Can’t imagine why we need to go to Excel. i also getting the same result like it is coming repeating level if we put that property. Nice post and regarding this topic, I am also drilling somewhat like this as Can we hide the Dimension Hierarchy level ? – There are hours related to projects, in this case only 5 hours were spend at Project1, none at Project2. Project2 isn’t shown because it has no hours. But since Project1 is the only one shown, I want level2 to be hidden; because it -optically- validates to OnlyChildWithParentName (though in the dimension it’s not true). Is this ‘works as designed’ or is there something I’m missing? That’s not working as it should be – have you set HideMemberIf on the correct level? Thnx for your quick response. The hierarchy is: Parent – Project, I’ve set the property on Project (not on Parent because it’s the highest level and I never want to hide that). Can you try setting it on both levels to see what happens? No, that’s not the case – something else must be wrong here. What happens when you browse the dimension in the dimension editor? thx for your great work until now, it already helped me a lot understanding ragged hierarchies and excel. but i still can´t get it done properly in a special situation. my hierarchy looks like this: 10 levels plus leaf level – only level 1 and 2 are always filled, the rest is optional. my attempt was like: ‘All’ – ‘Level1’ – ‘Level2’ -‘Level2’ – … – ‘Level2’ – ‘LeafElement’. i´ve set the excel mdx compatibility = 2.
it can be displayed properly on all levels in excel when i choose the dimension as background dimension. if i put the dimension in rows and i try to drill down, then my leaf level is always hidden. any ideas why leaf level is hidden in that case? Hi Martin, does the same thing happen when you check the ‘Show Empty Rows’ box in the PivotTable options? Hi Chris, i just tried it several times. It made excel crash everytime i activated “show empty rows”. The strange thing is, that it excel obviously can read the whole dimension with correct hidden members, but only when used in background. It made Excel crash? That sounds like a bug… you might need to open a support case. I just followed your example and I can get them hidden in Dimension Browser. But as soon as I put this Hierarchy with a measure in Cube Browser, I get no data (or I get only data for measures that reference a dimention element that have a valid values on all dimension levels.) Measures that reference a dimension element with hidden levels won’t be aggrigated/displayed! Have you tried browsing your cube in Excel? I don’t use the cube browser built into Visual Studio any more – it’s so bad and there are so many problems with it, it’s not worth bothering with. This could be an issue that only the cube browser has. Hi Chris, I have tried it in Report Builder and in excel using PowerPivot plugin, but I’m getting the same result as both are using the same tool as in Cube Browser! Yes, but what happens when you try querying your cube through an Excel PivotTable? Yes, from PivotTable I’m getting the correct results. I’m wondering now how that doesn’t work in SSRS! How can I get this to work if I have NULL in the first Level (e.g. Level1 in Level1->Level2->Level3). Also will this work if I have NULLS or do I have to populate it with a value? Dude, what a champ of a post! This saved my life! Thanks for sharing Chris. Struggling to get ‘Ole Excel to handle Ragged Hierarchies? Look no further than Chris Webb’s blog post. What tool are you using to view this hierarchy in the bit below ‘Then, with any sensible client tool, we can connect to the cube and browse the dimension as we want:’? It looks like SSMS but I cannot get this to work like this, I have numerous levels of Vatican in VS2013 and SSMS 2014. I have tried setting Compatibility level in Excel 2013 but it won’t save it and keeps reverting to 1. I am keen to sort this out as something I am working on has space in the mid levels in certain areas which I could use this for. thanks for the great article! I have a question. Any ideas about how to make it happen?